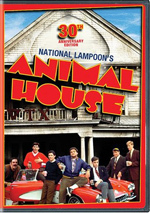 National Lampoon’s Animal House appears in an aspect ratio of approximately 1.85:1 on this single-sided, double-layered DVD; the image has been enhanced for 16X9 televisions. Not much about this transfer excelled. Actually, print defects weren’t too bad. Grain stayed within reasonable levels, and although I saw occasional specks and marks, these weren’t excessive. They distracted but not in a tremendous way. How do the picture and audio of this “30th Anniversary Edition” compare to those of the prior ”Double Secret Probation Edition? I thought both appeared to be virtually identical. I didn’t change my comments from the earlier review at all, as I felt the two discs provided extremely similar visuals and sound. The “30th Anniversary Edition” incorporates some of the extras from the “Double Secret Probation Edition” as well as one fresh piece. I’ll use an asterisk to indicate the new supplements. If you don’t see a star, that element appeared on the prior release. On DVD One, we find an Animal House edition of the game *Scene It?. This offers a mix of questions about the flick, and we get some minor trivia facts about the film as well. The game provides moderate fun, but its inclusion here almost feels more like an ad for the Scene It? series than an actual bonus feature. Don’t expect much from it. In addition to the film’s trailer, DVD One gives us the 23-minute and 22-second Where Are They Now? A Delta Alumni Update. Landis tells us that he wants to update his “documentary”, so we find out what happened to some of the movie’s characters. I won’t tell more than that since I don’t want to ruin surprises, but I will say that it’s amusing and a lot of fun. Only one extra appears on DVD Two: a 1990s documentary called The Yearbook: An Animal House Reunion. This 45-minute and 16-second show mixes movie clips, archival elements and interviews with director John Landis, producers Ivan Reitman and Matty Simmons, writers Chris Miller and Harold Ramis, Executive in Charge of Production Sean Daniel, head of production Thom Mount, script supervisor Katherine Wooten-Beattie, casting director Michael Chinich, editor George Folsey, Jr., John Belushi’s widow Judith Belushi Pisano, costume designer Deborah Nadoolman, composer Elmer Bernstein, and actors Kevin Bacon, Peter Riegert, Karen Allen, Stephen Furst, James Widdoes, John Vernon, Tim Matheson, Mark Metcalf, Verna Bloom, and Bruce McGill. “Yearbook” looks at the project’s origins and script development, getting backing for the flick and bringing Landis on board, cast, characters and performances, locations and anecdotes from the shoot, Landis’s work on the film, editing and score, and the movie’s reception/legacy. “Yearbook” provides a pretty good look at the flick. I like the inclusion of most of the film’s significant participants, and it moves at a brisk pace. The show covers most of the important areas and does so in an entertaining and informative manner. This is a very good little documentary. And that’s it for the extras! The “30th Anniversary Edition” loses some components from the prior release. It drops a subtitle commentary, a music video, and some text components. The omission of these components surprises – and disappoints – me. I especially miss the subtitle commentary, as it was pretty good. Why did this set expands to two discs and come with fewer extras? One of cinema’s enduring comedy classics, I think National Lampoon’s Animal House holds up pretty well after 30 years. While I don’t believe it’s quite as good as its legend indicates, it does amuse. The DVD offers average picture, decent audio and a few interesting extras. I’m not wild about the transfer, but the disc mostly satisfies. Though it satisfies less than its prior release. Both this “30th Anniversary Edition” and the 2003 “Double Secret Probation Edition” sport similar picture and audio, but the earlier set includes superior supplements. Since the 2003 disc is now out of print, you might be out of luck and stuck with the newer one, but if you can find it, the “Double Secret” version is the way to go.